Leti, a research institute of CEA Tech, in collaboration with CEA’s Fundamental Research Division and INSERM, has developed a new vaccine approach for HIV based on engineered lipid nanoparticles that deliver p24 – a viral protein that is key to an HIV vaccine – and optimize the CpG adjuvant’s effect. Until now, p24-based vaccines have shown limited effectiveness because of an insufficient immune response to this antigen in HIV patients. Based on its Lipidots® delivery platform, CEA-Leti’s new approach improves immunogenicity against the p24 HIV protein by loading it and an immunostimulant agent onto nanostructured lipid carriers (NLCs). This may be a first step for a new HIV vaccine that also would include additional components of the virus. 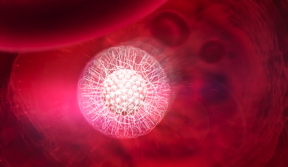 Lipidots® is a versatile nano-delivery platform that encapsulates drugs and/or imaging agents in tiny droplets of oil and delivers them to targeted cells in the body for patient treatment or diagnosis. The small size of the Lipidots NLCs, approximately 100nm in diameter, allows them to enter the body’s lymphatic vessels, which carry them to the lymph nodes where they trigger a stronger immune response. The results of the research project were published in npj Vaccines in October 2018 in an article titled “Overcoming immunogenicity issues of HIV p24 antigen by the use of innovative nanostructured lipid carriers as delivery systems: evidences in mice and non-human primates”. In the article, CEA-Leti demonstrated that with mice and non-human primates this new approach significantly enhanced immune responses against p24 by increasing specific antibody production and T-cell activation, when associated with Lipidots NLCs delivering the CpG immunostimulant. Indeed, the lipid carriers are able to protect the CpG nucleic acids from the extracellular environment and to deliver it intracellularly directly into the dendritic cells, the antigen-presenting cells that mediate the induced immune responses. CEA-Leti’s research partners on this study also include IDMIT and IAB-INSERM U1209.